Time Required - Two hours for walks A and B and between four and five hours for walk C.
Distance - Four miles for walks A and B, walk C is about eight miles. Terrain - Generally good paths, but some moderately steep climbs. 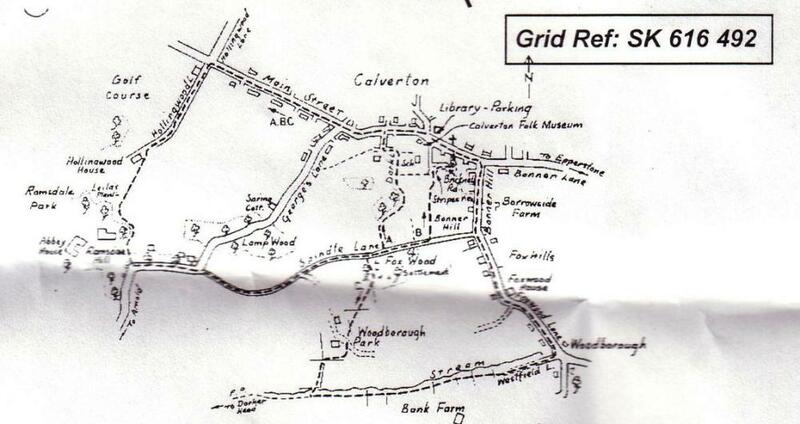 Description of walk - There are several attractive circular walks around Calverton, using various lanes, paths and roads. For the purpose of this guide, three will be described as A, B and C.
From the starting point of St Wilfrids Square car park turn right, passing the Folk Museum. Continue along Main Street, leading out of the village. Turn left after half a mile, just after West End, then go through a kissing gate and carry on past Hollinwood House. Yellow waymark arrows direct you over a field passing Cockpit Hill, an iron age fort site. Follow the edge of the wood around to the left and then to the right until you reach the track, from the old school which leads you down to the Calverton to Arnold road. Turn left and continue down the road until you reach a bridleway which is called Spindle Lane. Three quarters of a mile down the track, on the right is Foxwood, which is thought to be the first known habitation in Calverton. A few yards on from here is a signposted footpath to the left which leads down to Calverton. Follow this down to St Wilfrids school on your right and follow Dark Lane as it turns left. When you are opposite the riding school, turn right, down Woods Lane, to reach Main Street again, where you can return to your starting point in St Wifrids Square car park. For this walk, follow the same route (A) until you reach Foxwood. This time instead of taking the first path down to Calverton, take the second. This path leads you straight down across fields, before you get to the bottom turn left onto Stripes View. Turn right along Bricknell Road, follow the tarmaced path between the new houses on the left, cross a stile and turn right. This leads you onto Main Street, opposite St Wilfrids church. Near here are many old buildings, like the knitters cottages to the right. Retrace your steps along Main Street to return to the St Wifrids Square car park. Take route A as far as Foxwood, then take the path to the south, just inside Foxwood itself leading away from Calverton. This path eventually reaches Woodborough Park farm and is sometimes muddy, but it is worth it because of the lovely views from here. On the farm track, follow it round the farm buildings, until it reaches a footpath. Follow this down until you reach the Woodborough Lane (B684). Take two right turns which will lead you back down into Calverton. By turning left onto the valley bottom you can walk all the way into Woodborough itself, where a left turn will take you back to Calverton via Foxwood Lane and Bonner Hill. At the top of the hill, down into Calverton, you can turn left onto Spindle Lane and follow the bridleway to join walk A or walk B and return to Calverton across the fields.